Cocker Spaniels are very popular dogs. There are two distinct types of Cocker Spaniel in the UK, and they are really quite different. People who are interested in field sports will be most familiar with the Working (Field) Cocker, but the Show (Bench) Cocker has his origins in the same place. From over a hundred years of selective breeding, these dogs have evolved to be brave, with have a high hunting drive but a biddable nature that makes them relatively easy to train. However, in recent years Work and Show types have increasingly separated to become very different little dogs. A cocker bred from working lines physically resembles their ancestors quite closely. They are small but strong and robust, with high hunting and retrieving instincts. For their size they can lift heavy objects larger than their own size, jump high fences and hedges easily and run fast. They have bright eyes with tight lids, a medium length coat and feathered legs, chest and ears. His ears can also lift up on his head when he is paying attention, and won’t normally hang below his chin. They are popular as working companions, but also make lovely house pets for an active family. The cocker bred from show lines will have a rather different appearance to his ancestors. He will be a similar height to his working cousins, but his head is an altogether different shape. With a domed forehead and very long ears, that droop down well below his chin. His coat will be much longer, and will need more grooming and attention. He may also sadly suffer from loose skin on his face, causing his eyes to droop – often causing a painful in a condition known as ectropian. They may still have some of the hunting drive of their forefathers, but they will often be a calmer and more sedate companion for a family. Whilst show bred cockers could be worked, they will not be as well suited to the activity. They can also no longer legally be docked, which will put them at risk of tail damage when working in dense cover. Working and Show cockers both share a love of their human companions, but because of the demands of the field Working cockers can be a little overly clingy. You will find that every time you get up off your chair, your cocker will jump up from beside your feet and join you. Regardless of whether you were going to answer the door, make a cup or tea or visit the bathroom! A lot of us are very happy to be kept company 24/7, but if you like your space them a cocker is probably not going to give it to you. A working cocker will, due to his incredible instincts, need a lot of supervision outdoors when there is the chance of game appearing. A show type cocker will probably be more likely to walk along next to you, and ignore the hopping bunny that’s three fields over. This doesn’t mean that both varieties can’t benefit from at least some basic gundog training though. Your show cocker might not have the high drive that field trials expect of a spaniel, but he will have some instinct to run back and forth through the bracken. With proper training, he will benefit from the exercise and cement his bond with you by working together just as a working cocker would. Even if your show bred cocker has no interest in fetching in general, with the help of the clicker retrieve you can get him loving picking up dummies for you in the field in just a few training sessions’ time. Spaniels are quite prone to mammary cancer and pyometra, so spaying your female cocker will benefit her long term health. Their floppy ears also make them more likely to have ear problems, and this is something you will need to monitor whether you have a work or show type dog. They also due to restricted gene pools both carry a susceptibility to hip dysplasia and PRA blindness. If you buy a puppy, make sure the parents of the litter are both health tested for these conditions. Tests are also available for the less common but still consequential familial nephropathy and gonioscopy. For the best chance at a happy, healthy little dog, choose a pup from the healthiest, happiest parents you can find. Show Cockers and Working Cockers have come a long way, and moved in rather different directions. But they are both still at the end of the day, Cocker Spaniels. Whether you have a highly driven working cocker or a more sedate show bred dog, they will get a lot out of doing some fun gundog training with you. This article was first published in 2013, and has been revised and updated for 2015. My wcs is 3 months old now and the fact that I am even posting shows how besotted I am with him. Super-intelligent, he was completely house trained in 2 weeks and is amazing with out 3 kids. When he wants a walk now he finds his lead and carries it to the back door and lies down on my walking boots. Who needs language! I have a show cocker that is now 3 years old but I do go shooting a lot and was hoping to have him working with me why I am out but with work and all the rest that goes on did put all my efforts into him sorry to say. I have got him to come to me with his whistle and he will go where I point but will not pick up game that I had got. is it true that you cant teach a old dog new tricks or if the effort is there now could I turn him into the gun dog that I’ve always wanted him to be? I have a 3 year old show and a 8 month old worker. They couldn’t be more different. My show is more of a loner who will happily sit in another room to us and he plods along on his walks, just happy to have a sniff about. My wcs wants to be by our side permanently, craves attention and I’m sure she must have been a mountain goat in a previous life. She loves to climb. I have taken her to a gundog trainer but he advocates not using treats as rewards and this has knocked my confidence. How do you get a high drive dog to come recall reliably when there is no chance of a reward? Traditional training without valuable (to the dog) rewards is carried out with aversives using a ‘challenge’ method of proofing. As I am currently working my way through the excellent Total Recall (cat food pouches as a mega treat is genius) I think I may need to find another trainer. Hiya I have a 15 month black working cocker spaniel, when he wants attention he yaps and nips at me and if I try to tell him off it makes it worse, he’s such a good boy until he goes like this either for walk, drink or food if iv got something. Any ideas how to stop this. When he’s being good he loves sitting on sofa with head snuggled on my knee, he’s a good weight at 20kg but not overweight at all. The black (show) cocker at the top of the page is mine. Where did you get the picture from?? You have not been given permission to use it!!! The picture was purchased from an online library called dollar photo club. If you contact dollarphotoclub.com they should be able to tell you where they got it from. I’d be interested to hear what they have to say! – He’s a very handsome puppy but as he is not a working cocker, we’ll switch the photo around. I would like to assure you that we never take photographs without permission. Thank you for your very informative website and your “Total Recall” book is on it’s way to me as I am typing this. I had my eldest show cocker (now 8) trained to basic gun dog work and it really paid dividends. 20 minutes of dummy retrieval and engaging his brain is equivalent to a 5 mile walk and he thoroughly enjoys it. I intended to do this with my new show cocker (7 months) but he is such a timid chap that a strange dog running up to him can send him sqealing off into the undergrowth. Being able to him off lead in the open seems almost impossible. Your way of training seems to me they only way ahead as he responds very well to praise but not to even the slightest chastisement. Most of the trainers near me have methods which I think would make him worse, so I have decided it is just going to be me and your book(s). He learns incredibly quickly, is very affectionate and obedient but the timidness is worrying (didn’t show in either parent) and I have been told it can lead to defensive aggression in adult life. Although a show dog pedigree, he has more gun dog in his line than my eldest and I am wondering if this is the reason for his timidness. 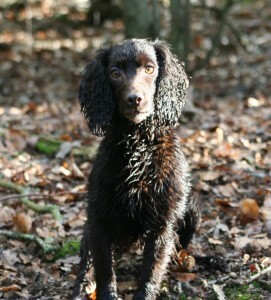 Will basic gun dog work help or hinder? “Even if your show bred cocker has not interest in fetching a stick” not a great line really. Sticks are dangerous. I have loved every minute of Total Recall and have almost memorised some aspects in my attempt to train my five month old working Cocker. However, I feel that I am becoming a little unstuck and am not too sure how to fix things before they get out of hand. Morven is perfect with other dogs, people, at home and in the garden and I have spent a lot of time proofing her recall. Fine. Until she gets the scent of a rabbit. Not even a furry little bottom. Just a scent and then she becomes absolutely deaf. I’m confused now about whether to hold her on a training leader or just let it go behind her. Unfortunately, when it trails if there is the slitest whiff of rabbit she gets carried away. She is so brilliant at recall the rest of the time, but even my tasty chicken didn’t help today. I had to wait until she began to come to me before I used my recall signal, but she was too far out of the zone of control for my liking and I don’t want her to get any worse. Please help. Ps keep writing your brilliant articles. They are invaluable to an out of her depth novice like me!!!! So pleased you have enjoyed the book. It is really important not to let her rehearse ignoring the recall, so you need to make sure that either she cannot chase, and/or make sure you do not use the recall when she is off on a chase or hunting scent. If you can’t be sure of success, don’t blow the whistle. You might also find it helpful to join the forum where it is easier to have a chat 🙂 . Thank you, Pippa. Keeping her closer is definitely helping.